I think it’s clear that this London Fashion Week is going to be very different to six months ago. As the fashion world comes to terms with the loss of Alexander McQueen, I am sure there will be a sombre feel in the air. The Week officially kicks off on Friday 19th February and runs through until Wednesday 24th February. So, how are we getting involved? Well, it is of course with brands that are a little bit alternative, a little bit cheeky and love to embrace make-up as a core part of their collection. One place where bright, brash and carefree fashion will be taking place is at the House of Blue Eyes. You may remember our involvement with Johnny Blue Eyes and his design team for SS10 last September. The futuristic gilded Egyptian Queen look was the vision and complimented the exuberant, optimistic outfits. Last Friday, Alex Box, her lovely assistant Suzy and I went to meet with Johnny to discuss this season’s theme and ideals. The show is on Saturday and promises to be great fun – Johnny knows how to throw a party! The second show we are collaborating with is A Child of a Jago, the menswear label by Joe Corre and Simon Armitage. 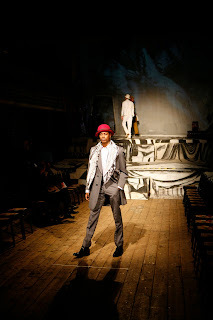 The SS10 show was at the wonderfully evocative and quirky Wilton’s Music Hall in EC1. This year, the show will be back in East London on Wednesday 24th February. Our national make-up artist Francesco will be heading up the team of artists for the 15 male models and 2 female models that will be parading the latest collection from the eclectic label. Finally, we will be working with Carri Munden and her Cassette Playa label. The street influenced brand has been rocked by the likes of M.I.A, Dizzee Rascal and The Klaxons. Carri describes the brand as “techno, primal, positive, tribal.” I have a real love of 90s influenced street style myself, so I am interested to meet Carri this afternoon to discuss the collection and the looks that our National Make-up Artist Adam will be creating for the show on Sunday 21st February.